Geopolitical risk is the biggest fear in markets right now, according to a Barclays survey of over 700 institutional clients. The firm says it’s a combination of developments on the Korean peninsula, tensions with Russia, political turmoil in Saudi Arabia, Brexit, and less predictability in US foreign policy. Sometimes there’s no bigger fear than the unknown. That seems to be the case in global markets right now, at least according to a survey of 700 institutional clients conducted by Barclays. Roughly 40% of respondents named geopolitical uncertainty as the biggest risk to markets, the survey showed. It’s an interesting selection, says Barclays, because there’s no immediately obvious global threat looming right now, meaning that anything that transpires will be a major surprise that catches people off guard. “The only way in which the global expansion seriously disappoints in 2018, in our view, is if the world economy faces a large exogenous shock – one that we cannot plausibly identify right now,” Barclays analyst Aziz Sunderji wrote in a client note. 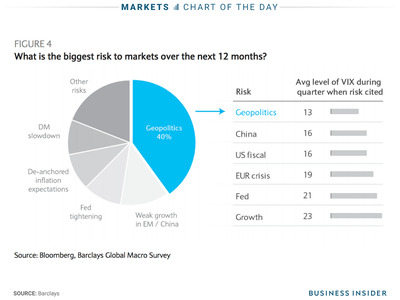 BarclaysGeopolitics are the biggest source of fear for investors surveyed by Barclays. And despite the lack of immediate clarity, it’s not altogether surprising that investors are citing some big global unknown as their biggest fear, considering where volatility conditions are right now, says Barclays. The firm notes that, over the life of its survey, geopolitical risk has been a popular response during periods of low overall market uncertainty. As noted in the chart above, the CBOE Volatility Index – or VIX, otherwise known as the stock market fear gauge – has been notably subdued during such stretches in the past, sitting near 13. “Historically, clients have cited this as the biggest risk when volatility has been low,” said Sunderji.